How Do You Add Mixed Fractions with the Same Denominator? Adding mixed fractions? 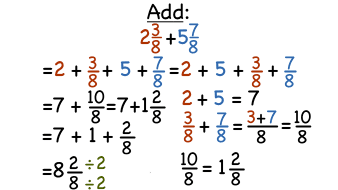 If they have common denominators, then you can add the whole numbers and fractions separately. In this tutorial, take a look at adding together mixed fractions! How Do You Add Integers Using a Number Line? Combining integers? You could use a number line to help find the answer! In this tutorial, see how to use a number line to add together integers with the same sign and ones with opposite signs. Take a look! How Do You Reduce A Fraction? Fractions involving large numbers can be a handful, but sometimes these fractions can be reduced, taking those large numbers off your hands. This tutorial shows you how to reduce a fraction to its simplest form. Take a look! How Do You Add Mixed Fractions with the Same Denominator by Converting to Improper Fractions? Adding mixed fractions? You could first convert each to an improper fraction. If they have common denominators, then you could add the fractions together, simplify, and convert the answer back to a mixed fraction. In this tutorial, take a look at adding together mixed fractions! How Do You Subtract Mixed Fractions with the Same Denominator? Subtracting mixed fractions? If they have common denominators, then you can subtract the whole numbers and fractions separately. In this tutorial, take a look at subtracting mixed fractions!